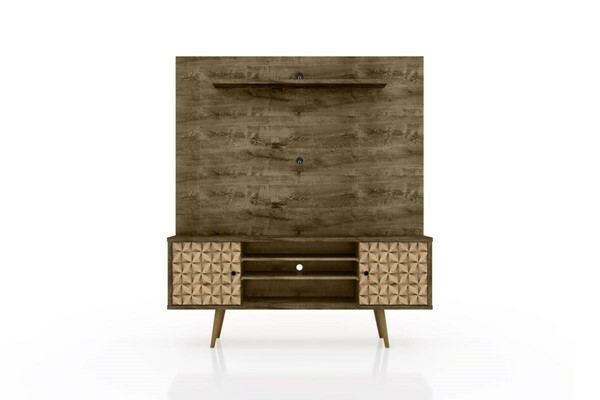 Entertain like you've always wanted to with the Liberty 63" free-standing entertainment center, a perfect blend of Mid-Century classic design and modern functionality. With open shelves and concealed storage, with ample space to serve all your media necessities, the piece is not only convenient, yet also keeps your favorite entertainment accessories neatly stowed away. Media holes provide wire management and keep your room looking seamless and sleek. Freestanding TV Stand for Living Room Use. Upon Assembly, Measures: 63 in. Length, 71.92 in. Height, 15.2 in. Depth. Features 2 Grommets for Wire and Cable Management and Concealment. Includes 1 Overhead Display Shelf, 2 Concealed Cubby Spaces and 3 Open Shelves. Keep Your Walls Clean and Free: This Freestanding Entertainment Center Does Not Need Any Wall Mounting! Weight Capacity : Panel can hold 45 lbs., Top Base Shelf 33 lbs. and 11 lbs. per internal Shelf.